Omega 3 fatty acids are essential to human health, and we must get them from our diet. These fats are polyunsaturated fatty acids, and most importantly include ALA (alpha-linolenic acid), DHA (docosahexaenoic acid) and EPA (eicosapentaenoic acid). While ALA is found in plant sources (such as flax seeds), DHA and EPA are found primarily in animal products, such as wild caught fish. Ideally, we can include fatty fish in our diet at least 3 times per week, but for many, this is not feasible. For this reason, fish oil is an extremely good idea for many individuals, although there is a lot to consider when choosing the proper fish oil supplement, as some can actually do more harm than good. The good news is, omega 3 fatty acids have been studied extensively, so there is no lack of scientifically based information on their vast benefits, and which types are best. Anxiety, depression and other mood disorders are increasingly common, and omega 3 fatty acids can seriously help. Fascinatingly, studies have shown that those who regularly supplement with omega 3’s for prevention are less likely overall to experience this conditions (1). Furthermore, those who already struggle with depression see very real improvements when beginning to supplement with certain types of fish oil (2). EPA is the specific fatty acid thought to most benefit depression and anxiety, and this is found much less in plant based sources and most in fatty fish, and in fact, one study even found it to be more effective than Prozac, and without the nasty side effects (3). Infants and babies in utero absolutely need sufficient omega 3 fatty acids for optimal development, particularly cognitive development. In fact, 40% of the fatty acids found in the brain (which consists largely of fat), comes from DHA (4), and it also has a major impact on eye and vision development. Omega 3 supplementation during pregnancy has been linked to positive outcomes later in the child’s development, such as increased intelligence, better social skills, fewer behavioral problems and a lesser chance of experiencing a developmental delay. Conversely, insufficient DHA is linked to developmental problems, impaired social and communication skills and several other health conditions. Multiple studies have been done over time that have looked at the link between societies that consume an abundance of wild, fatty fish and their decreased rate of heart disease, and this connection has largely been tied to omega 3 fatty acids (5), (6). Omega 3’s work to lower our triglyceride levels and blood pressure, reduce our chance of blood clots, raise our HDL (“good”) cholesterol levels and work as powerful anti-inflammatory agents. The verdict is still out as to whether omega 3 supplementation can help to prevent heart attacks, but it certainly can’t hurt. There are few superfoods or supplements that are superior to omega 3’s in fighting inflammation, which is crucial for preventing and treating many common health conditions. Normal and healthy amounts of inflammation are a necessary and important part of our immune response, but chronic inflammation can lead to serious diseases such as cancer, heart disease, arthritis, and much, much more. We know that omega 3 fatty acids are excellent for fighting long term inflammation in the body (7). For many years cultures around the world have touted omega 3 fatty acid’s ability to prevent cancer, and scientific studies back up this claim. One study showed that those who consume omega 3’s on a regular basis have up to a 55% lesser chance of developing colon cancer (8). And other studies have showed omega 3’s benefit in preventing prostate cancer in men (9). For those who do not get enough omega 3 fatty acids in the diet (which is most people), a high quality supplement becomes important. However, this can be confusing due to the many products available: krill oil, cod liver oil, processed fish oil, natural fish oil, ALA oil, capsules vs. liquid, etc. Skip to the FAQ portion of this article to find out the nitty gritty on which fish oil supplement to purchase for maximum benefit. In order to get enough omega 3 fatty acids naturally from food, you should be eating wild caught, fatty fish at least 3 times per week, and also including other plant sources of omega 3’s. The best fish sources include Alaskan wild salmon, wild sardines, halibut, albacore tuna and mackerel (all wild caught). While fatty fish is by far the best source of omega 3’s, you should also include plant sources such as ground flax and chia seeds, walnuts, extra virgin olive oil and winter squash (10). Remember that wish any omega 3 oil or natural food (nuts, fish, olive or flax oil, etc), these should not be heated at high temperatures (although olive can be heated on medium-low heat). This is to prevent the delicate fatty acids from oxidation, which can cause free radicals in the body. Instead of unhealthy salad dressing options like ranch, Italian, or other sugar and chemical laden commercial options, make your salad dressings at home out of olive oil and/or flax seeds, minced garlic and sea salt, and a splash of raw apple cider or balsamic vinegar. This is a super easy and effective way to supplement your daily diet with omega 3 fatty acids. Add ground flax and chia seeds to smoothies, sprinkle over salads and cooked vegetable dishes, or add to your morning yogurt or cereal. Blood Clotting Issues: According to Webmd, taking more than 3 grams of fish oil per day might keep blood from clotting and can increase the chance of bleeding. If you fall into this category, check with your provider to see what is appropriate for you. Digestive Upset: In some people, fish oil might cause fishy smelling burps, heartburn, nausea, or loose stools. However, this is likely a symptom of impaired digestion, so addressing the root, digestive cause is in order. Liver Disease: People with liver disease should avoid taking fish oil since it could possibly increase the chance of bleeding in those with liver scarring related to liver disease. Fish or Seafood Allergy: If you have a fish or seafood allergy, fish oil supplementation should be avoided. Low Blood Pressure: Because omega 3 fatty acids work to naturally lower blood pressure (a good thing in most people), those dealing with chronically low and problematic blood pressure should consult their doctor or healthcare provider before proceeding with omega 3 supplementation. Food sources should be fine. Mental Health Conditions: While omega 3 supplementation can work to support and even treat many mental health conditions, but if you experience worsening symptoms, it should be stopped and you should consult your doctor. Diabetes: Some studies have found that controlling blood sugar may be more difficult with high doses of fish oil. An Implanted Defibrillator: If you have a surgically implanted defibrillator it is best to avoid taking fish oil supplements since some studies have found that fish oil might increase the risk of irregular heartbeat in patients with an implanted defibrillator. A: Fish oil is the oil that comes from fatty fish, and is beneficial due to its high omega 3 fatty acid content. It can be obtained by eating omega 3 rich foods such as wild, fatty fish (the best option) and also plant sources such as flax and chia seeds, walnuts, winter squash and certain legumes. Q: What are the health benefits of taking fish oil? A: The list of benefits provided by fish oil is long, but the main benefits include increased cognitive health in adults and (particularly) in babies in utero and infants, decreased anxiety and depression, improved vision, better behavioral, social and academic outcomes in children, cancer prevention, reduced risk of asthma, reduced fat in the liver (prevention of fatty liver disease), increased bone and joint health, and more. Q: How should I take fish oil supplements? A: Fish oil can be taken as a pill, as a chewable, in liquid form. If supplementing in children, opt for a brand that has a less strong taste, or one specifically designed for children. Q: What types of fish are best to eat? A: The fish highest in omega-3 fatty acids include wild caught salmon, sardines, herring, tuna, and mackerel. Q: How much fish oil should I supplement with? A: The proper dosing for fish oil is dependent upon why you are taking the fish oil to begin with. Certain health experts claim that more 3 grams per day without medical supervision is a danger, although there is disagreement around this. If you are not consuming at least 3 servings of fatty fish per week, an equivalent dose in fish oil currency would be approximately 400 to 500 milligrams per day of combined EPA and DHA. Q: How do I find the right fish oil supplement? Be sure your brand includes both EPA and DHA. Many brands will say they contain 1,000 mg. of omega 3 fatty acids, and make sure the the EPA and DHA levels do not exceed 320 mg. per serving. FFA’s (free fatty acids) are better absorbed by the body, so look out for this on the label. A product will ideally be stamped with the GOED standard for purity. If not, they should be “third party tested,” which will also be indicated on the label. Be sure you are not purchasing a rancid product. Ideally it comes in a dark, glass bottle and is kept refrigerated. If not, smell the product, as it should not have an extremely strong, foul smell. Check the expiration date, as well. Green Pasture makes an excellent product. Q: What is the deal with omega 6 fatty acids vs. omega 3’s? A: Omega 6 fatty acids are not, by nature, bad. We actually need them and they also help fight inflammation and other conditions in appropriate quantities. The problem is that in our modern day diet, the ratio of omega 6: omega 3 is greatly skewed (optimally it is 2:1 or 1:1, but in our diet it is often as off as 12:1), and this greatly promotes inflammation. Foods to omit or eat only in moderation that high in omega 6 fatty acids include vegetable oils such as canola, soy and corn (totally avoid, if possible), and foods that contain these oils, such as highly processed and packaged products. Q: Can I take fish oil if I am pregnant? A: Absolutely, Omega-3 fatty acids can help to support a healthy pregnancy and proper fetal development. Cod liver oil is the best option. Q: Can I cook with fish oil? A: No, fish oil should never be heated. Q: How should I store my fish oil? A: If you are supplementing with liquid fish oil, the oil should be refrigerated immediately after opening. 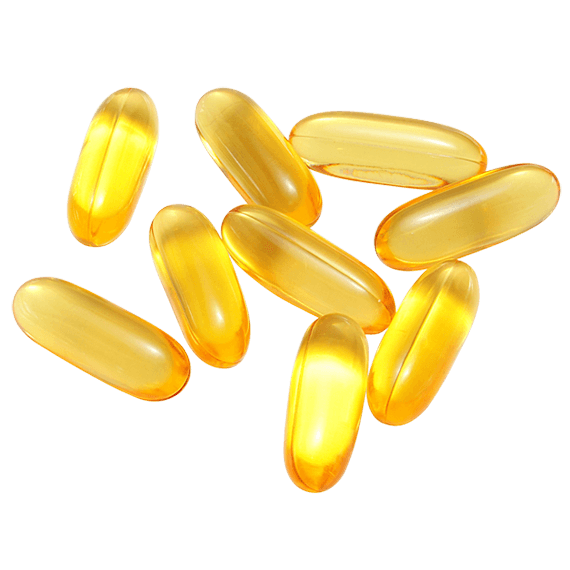 If you are supplementing with fish oil capsules, they should be stored at room temperature away from direct sunlight and away from high heat sources, although there is no harm in refrigerating them.